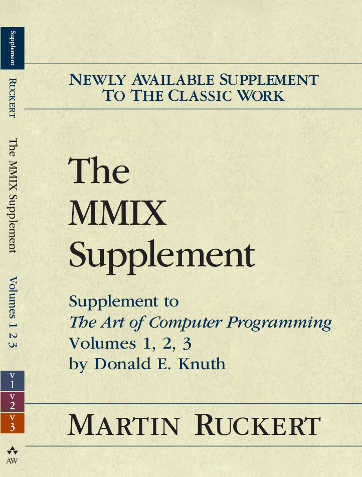 This page provides materials relating to The MMIX Supplement to The Art of Computer Programming. This Book (ISBN-13: 978-0133992311, ISBN-10: 0133992314) is available from Amazon or other bookstores. It contains the programs from Donald Knuths famous books rewritten for the MMIX computer. It is the final result of the MMIXmasters project. mmstotex, a utility to convert mms files to TeX files. mmstort, a utility to extract instruction counts from mms files, add them up, and compare them to a given sum. testgen, a utility taking a tst file (the test description) and possible several mms files producing a series of mms files as output. Each output file is a complete MMIX program that can be assembled and run to execute the test in question. ftoo, a preprocessor to convert floating point numbers to their hexadecimal representation. It can be used as a preprocessor for mms files (or tst files) that need to use floating point constants. page i, line 5: replace "Programmming" by "Programming". page ii, line 18: replace "Programmming" by "Programming". page 2, program line 34: This line might load a formatting character as the start symbol of the permutation. page 5, line 1: add a fixed space between "Eqs." and "(8). page 5, line 12: replace "concerning" by "connecting". in line 2 replace "T ← LOC[T]" by "table ← LOC[T]". in line 57 replace "Output Z." by "Output Z.". page 6, program line 40: replace "B4.Change" by "B4. Change". page 6, program line 40: replace "i" by "j". page 6, program line 41: replace "j" by "i". page 7, two lines above Program J: replace "C" by "C". page 11, line -6: replace "red and green" by "green and red". page 12, line 2: replace "SG and SR" by "GS and RS". page 14, exercise 15, program line 12: replace "Lines 12-18 remain as before." by "Lines 13-18 of Program A follow.". page 27, exercise 12: replace "Algorithm A" by "Program A.". page 32, program line 148: replace "Delete C" by "Delete NODE(C)". page 32, line -2: replace "function" by "functions". page 36, exercise 7: replace twice "D1" by "d1". page 39, line -11: replace "have conveniently" by "conveniently have". page 43, program line 1 and 4: replace "LDO" by LDOU". page 43, program line 2 and 3: replace "." by "," and indent "jump if so." page 43, section 2.3.3, first line: replace "six" by "five or six". page 43, display 17: Exchange LEFT and RIGHT two times. page 44, line 8: add a space between "..." and "Therefore". page 45, display 7: Exchange LLINK and RLINK. page 46, display 9: Exchange LLINK and RLINK. page 47, exercise 33: Add "Design an algorithm ..." at the end of the exercise. page 56, line -6: replace "fv" by "fv". page 57, exercise 14, line 3: replace "64 bit" by "64-bit". page 58, page header: replace "4.2.1" by "4.2.2". page 63, Program S, line 08 and 10: replace "Carry" by "Borrow". page 64, page header: replace "" by "". page 66, Program line 54: replace "ui+J" by "uj+i". page 67, exercise 13, line 1: replace "is a" by "is". page 68, line 5: replace "it" by "x.
page 70, Program A and Program B, line 01: add ":" before "Gcd". page 76, line -9: replace "" by "...". page 78, line 2: replace "h0" by "h0". page 78, program line 12: replace "Bump q, q" by "Bump p, q". page 79, line -16: replace "lists heads" by "list heads". page 79, Program M, line 10: remove the extra space before "M2". page 80, program line 15: remove the extra space before "M3". page 80, equation 19: replace the final "," by ".". page 80, line -10 and -9: add a comma before "it is approximately". page 81, exercise 33: replace "improve an" by "improve on". page 84, page header: replace "" by "". page 83, program line 43: add a period at the end of the line. page 83, program line 47: remove the extra space befor the comment. page 84, line 21: add a comma at the end of the line. page 85, line 13: remove the comma after "loop". page 87, Program S, line 13: delete the extra space before S3. page 90, L1, line 4: add a space between "..." and "and". page 92, exercise 9, line 2: add a space between "..." and "in". page 97, line -3 and -2: replace "algorithm" by "program" and replace "Algorithm" by "Program". page 98, Program Q', program line 04: replace "key1 + i" in the comment by "key1". page 98, Program Q', program line 11: append "(next)" at the end of the comment. page 106, line 4: append ")" at the end of the line. page 107, line R in Table 1: The content of this line should be re-positioned one place to the right; I.e. the first entry should be empty, ‘ARE’ should be in second place, ‘FROM’ in the 4th column, ‘OR’ in the 7th column, and ‘HER’ in column 11.
page 108, line 9: replace "(page 446)" by "(page 440)". page 109, line 9: replace "1050" by "4.6*1049". page 109, line 10: replace "1042" by "2.25*1042". page 109, line 11: replace "about one of" by "about five of". page 109, equation 4: make the innermost parentheses a bit smaller. page 113, line -12: correct quotation marks. page 113, Program L, line 01, 14, and 17: replace "LDO" by "LDT" and "STO" by "STT". page 114, Program D, line 01, 21, and 24: replace "LDO" by "LDT" and "STO" by "STT". page 117, line 1: replace "haven" by "have". page 120, Solution 7: See BUG 1.3.3 A.
page 124, line 5: add a space between "..." and "are". page 144, exercise 28, program line 17: Add "Is " at the begin of the comment. page 150, Solution 4, line 2: replace "greater or equal than" by "greater than or equal to". page 151, Solution 14, line 2: replace "64 bit" by "64-bit". page 152, line preceding 4.2.2: add a comma after "slower". page 159, exercise 13, program line 6: replace "SL i,m,3" by "SL i,m,2". page 160, exercise 19: remove the extra "F" from the constants for m2 and m3. page 165, exercise 3, program line 5: replace "BNP t,1F B+2A" by "PBNP t,1F B[A]". page 165, exercise 3, program line 10: replace "BNN i,2B B+3 Loop while i ≥ 0." by "PBP i,2B B+1 Loop while i > 0." page 166, page header: replace "" by "". page 166, lines -4 to -1: replace "These iterations ... 8 percent." by "These iterations can be avoided by inserting the instruction sequence SL c,m,1; CMP c,c,n; BNP c,=F; SUB m,n,h before line 09. This will improve the running time by about 8 percent.". page 168, program line 27: replace "Ki+1" by "Ki+1". page 170, program line 16: Remove the period at the end of the line. page 170, program line 29: replace "Ki+1" by "Ki+1". page 169, page header: replace "" by "". page 169, program lines 01 and 10: remove the extra space before the comment "M1." and "M2.". page 170, page header: replace "" by "". page 170, program line 01: remove the extra space before the comment "M1.". page 171, page header: replace "" by "". page 170, exercise 34, line 9: add a space before "for 1"..
page 172, program lines 13, 15, and 16: remove the extra space before the comments "R7. ", "R6. ", and "R5.". page 173, program line 45: remove the extra space before the comment "S1.". page 174, program line 17: remove the extra space before the comment "S3.". page 175, page header: replace "" by "". page 175, Solution 9, line 3: insert a closing parenthesis ")" before the semicolon ";". page 176, program line 41: replace "ij" by "ji". page 183, Solution 6, program line 03, 04, and 05: delete "+i" in the comment. page 188, line 11: replace "Program 2.1A" by "Program 2.1-(5)". page 188, line -5: replace the hyphen by an en-dash. page 190: consolidate the entries for "Fclose", Fopen", "Fread", and "Fwrite". page 191, line -4: replace "Robert" by "Ronald". I will gladly reward any first finder of an error, be it technical, typographical, orthographical, grammatical, or otherwise, by sending her or him a nice MMIX T-shirt (as long as supplies last).